Fans of raw chocolate claim that their version of chocolate is better for the environment, better for your health and even, they say, tastes better than the classic form of chocolate. So called raw chocolate is actually the bean itself or a nib of the bean, in its natural state. To obtain nibs, cacao beans are roasted, cracked and shelled and the resulting fragments of bean are called nibs. They are essentially dry-roasted cacao beans. Because they have not been processed, they are high in theobromine which is a compound that has been identified as contributing to chocolate’s reputation as an aphrodisiac. In addition to its love-promoting tendencies, theobromine is classed as a myocardial stimulant and a vasodilator, which means that while it increases the heartbeat it also dilates the blood vessels which means it gives the heart an exercise boost but at the same time reduces blood pressure. It’s actually a bitter alkaloid which is why we generally add sugar to cacao nibs to make it more palatable. In addition to theobromine, cacao is complex, it’s packed with over 300 chemical compounds and is higher in antioxidants than green tea, or acai berries, both of which are promoted as detoxifiers. 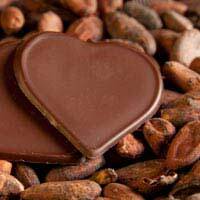 Cacao also contains calcium, iron, carotene, thiamine and riboflavin and is lower in sugar and fat than chocolate. Generally raw chocolate is combined with cocoa or coconut butter or agave syrup to make a malleable paste. This paste, which can be shaped and pressed is mixed with berries, nuts and essential oils to add flavour. Many forms of raw chocolate have no vegetable or saturated fat, dairy products or refined sugar, which means they are healthier. In addition, unlike traditional chocolate, raw chocolate is not heated. This is important because raising cacao above 42 degrees Celsius means that some of the nutrients it contains are destroyed. Why is Raw Chocolate Better For You? Fans of raw chocolate say that the taste is much more intensely chocolaty, which means you need less of it to satisfy your craving. They also claim that it has a higher nutritional profile and that it contains many fewer ingredients that are bad for you. Why is Raw Chocolate Good for the Environment? The production of raw chocolate is less energy intensive. Because it’s very much a health product, there has been high awareness of the need to reduce packaging and use recycled and biodegradable packing materials which means there is less waste. Many raw chocolate production companies have a different ethos about their suppliers too: nearly all of them have established links with cooperative farmers in South America, where fair trade principles ensure that reasonable wages are paid, farmers have good working conditions and community investments in health and education are made. There are a number of UK raw chocolate companies with Soil Association certification too. Put the first four ingredients in a blender to achieve a granular consistency then add a the agave syrup and flavouring and pulse for a couple of seconds. Place the resulting mixture in a bowl in the fridge for half an hour to chill so that you can shape it with your hands into tiny egg shapes and then refrigerate again. You can decorate the eggs with crystallised violets or pieces of ginger. The chocolates will keep for up to fourteen days if stored in the fridge.